Oh great, an article about Johnathan Thurston’s retirement. Didn’t those become passé several months ago? I offer my sincerest apologies, for it was only this past weekend that I chose to accept his retirement, and thus give myself a chance to process it. I’m usually okay at rugby league retirements. Players come, players go – it’s the circle of life. But when it comes to a player like Johnathan Thurston, I’m not so good at saying goodbye. The first time I truly felt a case of PRST (post retirement stress disorder) was one particularly onerous day in 2007, when I was only 13 years old. I woke up one morning feeling as though my entire world had been turned upside down, for the previous day Andrew Johns had retired. All these years later it still ranks among the most miserable days of my entire life. I walked to school in a daze, Simon and Garfunkel’s ‘Sound of Silence’ playing on repeat in my headphones. At one point I stopped before a house with a number 7 on the mailbox and, bottom lip quivering, quietly mumbled ‘That’s the number Joey wore’ before continuing my arduous trek to school. My melancholic state eventually prevailed over my desire (or lack thereof) to be in class, and I resorted to my school’s ‘sick bay’ where, when asked by the nurse which ailment had resulted in my visit, I simply said “A future immortal retired yesterday”. I still haven’t forgiven her for sending me back to class, but I digress. Twelve years later I’ve come to realise that, while I’ve matured somewhat as to the manner in which I react, Thurston’s retirement has hit me just as hard as that of Andrew Johns. The reason it didn’t hit me sooner was because unlike Joey, whose retirement was sudden, I had a whole season to appreciate ‘JT’ with the knowledge that it would be his last. It was while watching Johnathan Thurston highlights on YouTube this past weekend that this sort of depressing epiphany, a realisation I had been ignoring for months, and was thus not fully prepared for, sprang upon me. I jolted upright, and said the words to myself slowly, almost in disbelief – “I will never watch Johnathan Thurston play again”. “What planet has this guy been living on?” I hear you ask. Valid question. I get it, the rugby league world has moved on, for it – much like the world at large – is always looking forward, eager for whatever the hell may be coming next. But for me, when it comes to players who rank among the greatest of all time, I have a much more difficult time letting go. Unfortunately, in my adulthood there’s no ‘sick bay’ to which I can retreat in these times of great distress, so instead I thought I’d take some time to write about this loss instead, and share some of my own personal memories of Thurston’s career. To be honest, I was very late when it came to being a passenger aboard the ‘JT’ hype train. Much of this could be chalked up to my own naivety, as well as a brief hiatus from watching the game, but I eventually came to recognise his place among the pantheon of greats. I’m somewhat embarrassed to share the following anecdote, because this admission will undoubtedly earn much derision and scorn by whomever reads it (deservedly so, mind you). It wasn’t until a bitterly cold evening in 2015 at Brookvale Oval that I truly came to appreciate Thurston’s greatness. Sure, he’d won Dally M’s and countless man of the match awards, but watching him play that night I said to myself “This guy is on another level”. An understatement if ever there was one. That game wouldn’t even rank among his top 62, hell even 74, best performances, and he probably wasn’t even the best player on the field in terms of statistics and tangible contributions, but watching him up close for the first time was a revelation for me. Just his presence alone was noticeable. Even when he didn’t have his hands on the ball, or near the play, he was involved. He controlled almost everything, and did so with ease. Of course, none if this is groundbreaking information for anybody, but I walked away that night with a tremendously heightened appreciation for Johnathan Thurston and his impact upon the game. I can’t imagine how Thurston felt during grand final week later that year, because I was a wreck. Just an absolute mess. 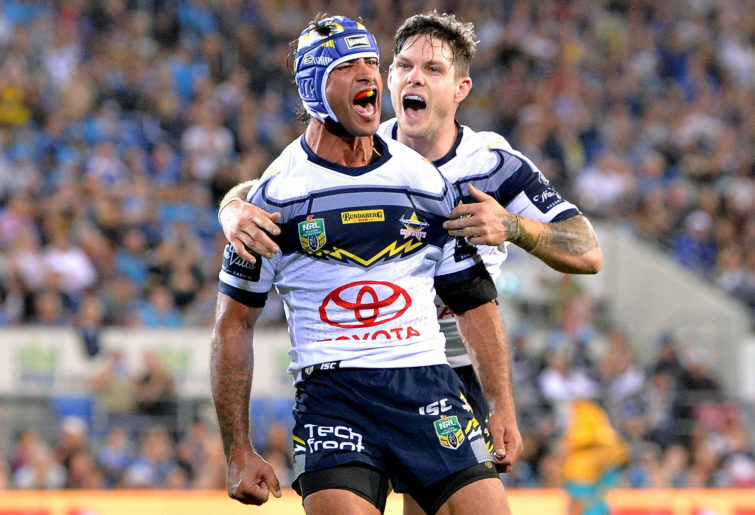 Thurston’s Cowboys were set to face Queensland rivals the Brisbane Broncos, and I have never wanted a team to win as much as I wanted North Queensland to prevail that night. I’m not a Cowboys fan, but I desperately wanted Thurston to win that elusive Premiership he so desperately craved. For much of that week I couldn’t sleep. I couldn’t eat. I daresay that I didn’t even live, I merely existed; all I wanted was for Thurston to hold that trophy high into the Homebush sky. Come the night of the Grand Final, I couldn’t even bring myself to watch the game. I forced myself along to a small social gathering, where I would be surrounded by people who had no idea that it was a defining night in the career of one of the greatest rugby league players to have ever played the game. Toward the end of the night, not able to wait any longer, I pulled out my phone to check the score as I knew the game would almost be over. I quickly excused myself, and drove home feeling completely empty. I knew Rugby League had the potential to be a cruel game, but denying Thurston a premiership with the Cowboys was a bitter blow. Five minutes into my drive, I found myself pulled over, listening intently to Triple M’s Grand Final call. Turns out that although the score tracker on NRL.com read ‘80 minutes’, play had not yet ceased. We all know what happened next; Feldt scores, Thurston misses the conversion…only to kick a field goal in extra time to win North Queensland their first ever Premiership. I’ve been to several Grand Finals, and witnessed plenty more on television, but sitting in my car listening to the final twenty minutes of that game, and the ensuing celebrations, in some random street in suburban Sydney remains my most cherished Grand Final memory. For it was a testament to everything great about rugby league, and at the centre of it all stood a man who represented the absolute best the game had to offer. A once in a lifetime player who left an indelible footprint on Rugby League. A future immortal who has played his last game.